This 17-inch sitting statue showcases the detail of an ancient Buddha. This hand-crafted statue is sitting in the lotus position. It has a heavy resin display which complements similar furnishings. This piece can be used artistically or as a gift. This statue is beautiful. After looking at so many different styles and faces, this was the one. The face is perfect and beautiful. The color is unique and the size perfect. We have it in our garden by the pond and it just adds that much more tranquility. It is a lot lighter then I expected, but that is okay, it won't blow over or go anywhere. We are very happy we came across this one, because it is the one. this is not only a review for my new fish pond buddha. I know the koi love it and it just looks beautiful, but better than that is the great service Overstock.com has given me. My first buddha arrived broken..I didn't have to send back the broken one..I didn't have to prove it was broken, no paperwork. I called overstock & they sent me a new buddha. Easy breezy. This is my new favorite store. Thank you Overstock for great service! Lovely piece. Very good value for the money. I collect antique Buddhas but do have some non-antique ones in places where they could potentially be damaged. This one was selected to grace my master bath vanity where I wanted a darker Buddha to accent the quartz countertop and add a note of serenity to the area. This one fit the bill exactly and I won't have to worry if it gets an occasional splash from the sink. The color and draping of the robes is reminiscent of the EDO era Buddhas without the $** or greater pricetag. Gave this as an anniversary gift for our children. They love it! I thought it would go in the garden and they have it in the living room. It has a rich deep color. Well worth the money. I have a desert landscape and a small meditation garden and this statue is perfect in it. I purchased this Buddha as a mate to one I bought earlier. They are gorgeous as a separate piece but make a truly beautiful set. The features on this Buddha are lovely and serene. I am thrilled with them! I was really disappointed with this purchase. Color in the picture is compleatly different from the actual product. It's completely black and there is no shine to it. I lost money with this purchase, because I had to pay to ship it back. I am not Buddhist .. but am very spiritual. I find the Buddha very calming .. very peaceful .. very serene in my sometimes crazy busy world! I bought one originally for my terrace .. LOVE looking out as we eat to see the serenity of my Buddha .. it calms me. That being so .. I decided to get one for my bedroom! Why not be serene just before bedtime .. be reminded of what is lovely and wonderful in life .. NOT the few things that ,may interfere with serenity .. let those things go .. after all HAPPINESS IS A CHOICE! The statue arrived in perfect condition and in a timely manner. Love it! Love this Buddha, I have it my living room! Not really any color like picture shown, just looks black. Looks like it is carved out of wood and then stained. The details are excellent and I just love the look. I'm very pleased! We chose this Buddha after looking at several because of the size, color, and price. He's a perfect fit for our home. So glad we ordered it. Bought this one for my nephew and he loves his Buddha, it is so natural looking. Great gift!!! Can’t beat the quality of this product for the price. Thank you! I would buy again and even thinking of getting a few for family for the holidays. Very well made &amp; extremely fast shipping. Like other household items I have purchased for my house through Overstock this Buddah is spectacular in my house. Very nice quality and a good price. Would order again. We have this seeet guy centeted on a shelf that tops a large entertainment center. He is surely a focal point; in fact I wish he was slightly larger. We get lots of compliments on him. I love this Buddha. The detail is wonderful and is a nice size. It has a oiled bronze color which does make it look like it is metal. I have placed it outside but will bring it to a safe place for the colder northeast winter. "Does this statue need to be protected from ice and snow? I asked the same question before about a volcanic ash statue and didn't get an answer. I'd like to know what is best material for a Buddha that will stay outside in the harsh New England winter." Hello cmd, protection from harsh weather elements will help preserve the statue in its current condition. In my personal opinion, this item should be covered or brought into a sheltered area in harsh weather conditions. Thank you for shopping with us. 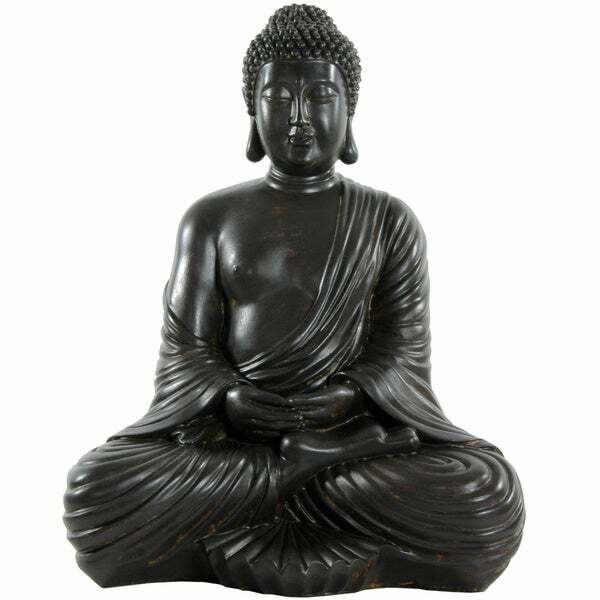 I am looking for large Buddhas (30 inches or taller) and although this one is not that tall, it looks beautiful and I think both it and the other two I am ordering today will be a nice addition to my home. Hello randomhome, we appreciate your inquiry. The approximate shipping weight on this item is 12 lbs. We hope you have found this information helpful. Thank you for shopping with us. Have great day! "what color is this? Some reviewer mentioned that the color shown in the pic is different that what he received. I am not looking for black but I am looking for this same color"
Hi rmaiya, this is not black is its more of a oil rubbed bronze color. Thanks for your interest, hope this helps!